I’m throwing a family Christmas party, like I do every year, and I wanted to make a crowd pleaser for the people who won’t drink a Manhattan. So I decided to tech it out a little. I was in a grocery store and saw a bunch of fresh cranberries, and thought surely there’s a cocktail there somewhere. So step number 1 was making cranberry vodka. I used Dave Arnold’s Justino method. 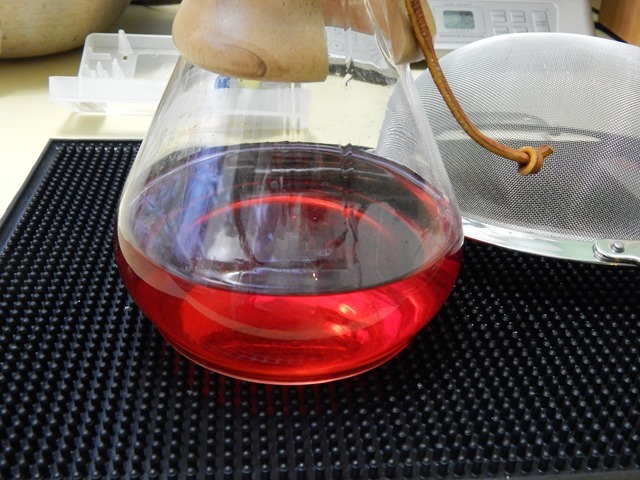 I blended 750 ml of Sobieski (my vodka of choice, because it’s very cheap and very flavorless) with 250g of cranberries and 2 grams of Pectinex Ultra-SPL. I let that sit for a few days until it separated. 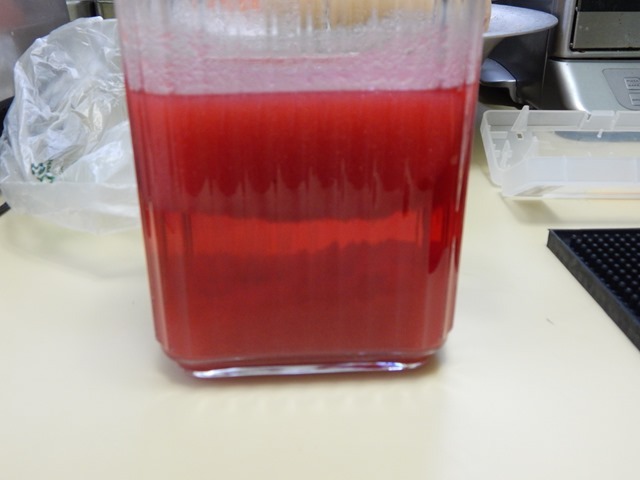 The cranberry puree actually floated mostly to the top, so I couldn’t rack it off like I could with the banana rum or pumpkin rye. 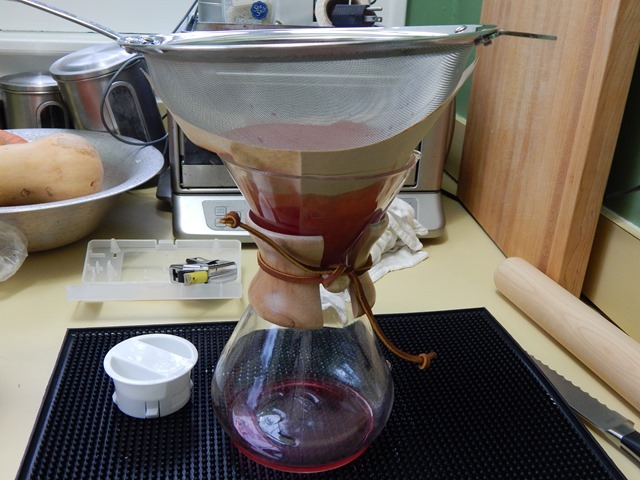 I decided to just pour it through a coffee filter and hope the particles were large enough to not pass through. Next up, what to do with it. The cranberry vodka that came out was very tart. (Not surprising if you’ve ever eaten a raw cranberry.) Since I had made it for my family, many of whom are the sort to ask for a “martini” and mean something sweet, colorful, and probably with vodka served out of a martini glass, I wanted to come up with something they’d enjoy that wouldn’t make me hate myself for serving. If there’s one liqueur that’s sort of sweet and acts like bartender ketchup, it’s St. Germain. So I constructed a cocktail. I shook and strained into a chilled martini glass, and garnished with a lemon twist. I meant to snap up a picture, but I had a family Christmas party underway. The guests seemed to love it. It looked pretty and didn’t taste like liquor. It wasn’t the sort of drink I’d generally make for myself, but it wasn’t bad. If I were making it for me I might dial back the simple to 1/4 oz, as I tend to like things a bit less sweet than your average “martini” drinker. But really it wasn’t cloying even like that. This entry was posted in Recipes and tagged justino, modernist, original on December 25, 2014 by Genius.